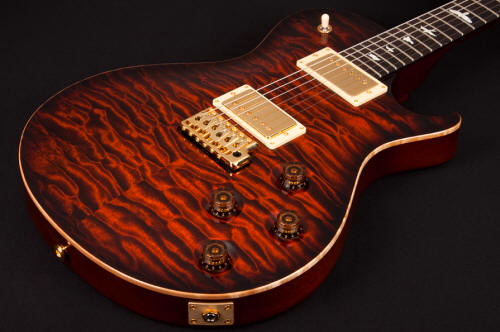 PRS Paul Reed Smith Private Stock are supposed to be the pinnacle of PRS guitars. Here's a guitar from 2010 to see exactly what makes these guitars special (or not) and why do they cost sometimes more than a new auto? The PRS Paul Reed Smith Private Stock guitars are supposed to be at the height of the art of making a guitar. With PRS 'Private Stash' (don't you just love that hype) of wood that surely ran out years ago if you really believe that Paul Smith ever had any, these guitars continue to carry a very high price but in recent times have been severely devalued through over production AND new higher level models being introduced. This is a review close up and personal of a PRS Private Stock single cut from 2010 which was made from the PRS premium woods available at that time, hand selected by a dealer (so they say) and eventually completed for sale. The fact is though, while this guitar commanded ridiculously high retail pricing in reality it never achieved those heady heights in the real world. The originating dealer cleared it when it did not sell back in to a network of unauthorized dealers eager to sell it at a realistic price. Likely someone took a big hit somewhere so maybe dealers are beginning to wake up and realize that guitars of this level simply don't justify that high cost. In any event lets get on with the review of this great guitar. This review is being developed right now and the news page will show when its online. Here's a video review of the PRS Private Stock that I did for my YouTube channel.